William brings over 25 years of expertise in the salon industry and has worked as a salon owner, celebrity stylist, TV personality, stage artist, and entertainer. William loves to pass on his expertise to others and get his peers as excited about the industry as he is. His passion and responsibility for education is unsurpassed, motivating all hairdressers about their craft, while his never-ending stamina and animated personality spark their artistic flow. His stage presence is inspirational, yet cutting edge, taking any stylist in his audience to a higher level. William joined the All-Nutrient design team in spring 2016. Since then, he has worked on photo shoots, beauty shows, and advanced education classes. He co-created the All-Nutrients Geometrics system. His genuine enthusiasm for the art of the hair industry, combined with some serious scissor skills (and more) make him a vital part of the All-Nutrient team. William has owned salons throughout his career and has learned how to effectively market high-end salons by leveraging public relations, media and networking. His former salon, William Whatley International Salon in Las Vegas catered to the elite of Las Vegas and names like Tiffani-Amber Thiessen, Rita Rudner, Chippendales, Thunder from Down Under, Shirley MacLaine, Diana Degarmo, Page Davis, and Kristine W to name a few. In 2002, William launched his own haircare line that was the official hair care products for N’Sync’s last tour. Back stage at Billboard Awards, American Music Awards, Golden Globes, People’s Choice Awards and Kids Choice Awards, the products attracted stars like Beyonce, Pink, Jessica Alba, Tara Reid, Shannon Elizabeth, Mila Kunis, Apolo Anton Ohno, Hilary Duff, Nick Carter, Amanda Bynes, Gwen Stefani/No Doubt, Donald Logue and Justin Timberlake. You may have seen him as lead host of FOX’s Ambush Makeover, the hit television series or on other TV shows where he appeared such as Oprah, ON-AIR with Ryan Seacrest,The Other Half and TLC’s Wedding and Makeover Stories. He’s also been on the Style Network and done several beauty segments for FOX Denver, FOX Minneapolis, FOX LA, FOX Atlanta and FOX New York. 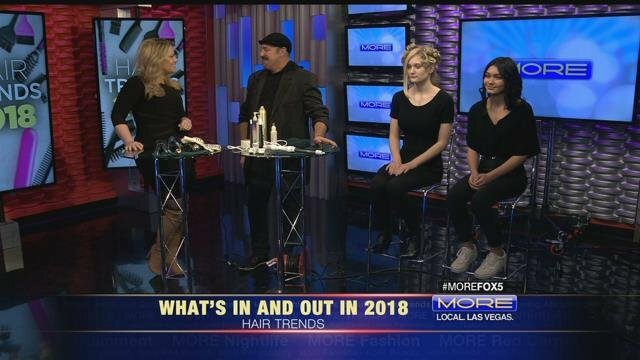 For five years, he had a weekly beauty segment for FOX Las Vegas. William has worked behind the scenes with big fashion names like Dolce & Gabbana, Betsey Johnson and Roberto Cavalli to key the hairstyles for many runway shows in Las Vegas. With a charisma and energy, William has graced stages all over the world with his raw talent. He has worked as a platform artist for Sebastion and Goldwell, was artistic director for Scruples Hair Care and Aerorasor. He was also a headliner on the Las Vegas strip with his 8-minute makeover extravaganza in the V The Ultimate Variety Show. William has been featured for his work in People Magazine, Modern Salon, American Salon, Sophisticate’s Hairstyle Guide, Chicago Tribune, Los Angeles Times, NY Times, Denver Post and was featured in Top 40 Under 40 by the Las Vegas Review Journal. He was named one of the top 50 hairdressers of the year two years in a row in Behind the Chair. Despite his busy schedule, William always makes time to give back. He has donated his time for the Cancer League of Colorado, Boys and Girls Club, Excelsior Youth Center and Aid for AIDS of Nevada. He was honored with the Cancer Society Excalibur Award for his efforts with the American Cancer Society. looks good brother. I will everyone know about ‘GOOD DAY LA’! If you'd like more information on show bookings, personal appearances, education or just want a fabulous new look, please send a note. Copyright 2019 William Whatley. All rights reserved.